Hazel can't wait for her baby brother to arrive. She practices reading aloud with her stuffed bunny Rodrigo, anticipating the day when she and her brother can read and discuss books together. When Edgar does arrive, Hazel must continue to be patient since he doesn't do much those first few months. Hazel read Edgar stories, but she didn't know if he understood. She wished he would whisper questions. Like a pointing, grunting watermelon. When Edgar does finally say his first word, both Hazel and her mother are elated. But they soon find out that Edgar's first word causes more trouble than they anticipated. Basically, he turns grumpy and growly and shouts this word ad nauseum. It isn't long before Hazel's patience is tested once again. Not because Edgar can't talk, but because he won't stop saying the same word over and over. 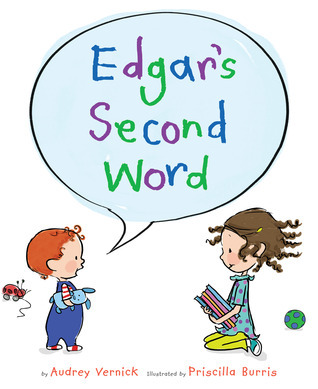 Hazel's mother deals with Edgar's tantrums with the patience Hazel lacks, going so far as to say, "I believe you just said your first sentence," to Edgar as he monomaniacally unleashes a long string of first-word rantings. Hazel, on the other hand, does not agree with her mother that "there's nothing sweeter than hearing your baby talk for the first time." Try as she might, Hazel encourages Edgar to attempt new words, but to her chagrin, he continues to stick with the one he knows. One of these days, Hazel is hoping for the Edgar she dreamed about before he was even born: one who will read and discuss books with her. That day is looking more and more like it may never come... until Edgar says his second word. Back at NCTE in November, I had the privilege of presenting a session on using picture books as mentor texts with the ridiculously talented Audrey Vernick. She is my picture book author idol, as evidenced by the fact that she is the author whose books I have (glowingly) reviewed the most here on the blog. How she manages to come up with such amazing, clever ideas for books and then reduces that story down to only thirty-two pages is nothing short of genius in my mind. When I had the opportunity to read a sneak peek of Edgar's Second Word back in November, my envy of Audrey's talent continued. Her writing is always clever, sharp, and full of life. Many of her books are downright hilarious, (Is Your Buffalo Ready for Kindergarten, Bogart and Vinnie) but Edgar's Second Word, while humorous, is done with a much gentler touch. It still contains Audrey's sharp wit, but it is coupled with equal parts sweetness. Lovers of Mo Willems's Knuffle Bunny books will undoubtedly fall in love with Hazel and Edgar. 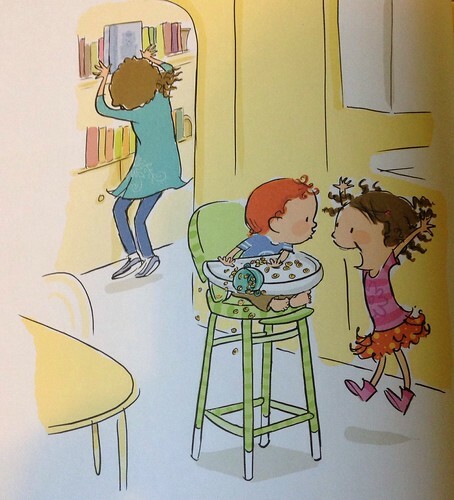 Equally as charming as Audrey's writing are Priscilla Burris's illustrations. She finds a way to make the reader fall head over heels in love with a rabidly shouting toddler -- not an easy feat by any stretch of the imagination. But equally as charming as Edgar's tantrums are the little details she throws in that give you a good chuckle or make you sigh with contentment, such as how Edgar's mom is in the other room grabbing the baby book off the shelf while he is shrieking his first word in the kitchen with Hazel. There is so much that will make you laugh, smile, and just fall in love with Edgar's Second Word. This would be a lovely gift to give and read with a child who is anticipating the birth of a first sibling -- or perhaps as a way to prove to said sibling that "things won't be like this forever, dear."